About five years ago, another author, Michael A. Black, and I wrote a book together. It came out the same time as State of the Onion, but where that first White House Chef mystery i a cozy, the book I wrote with Mike is absolutely not. 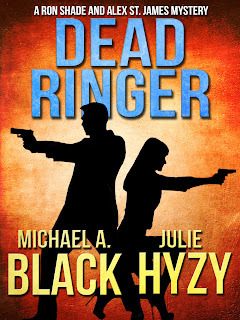 Dead Ringer marked the fourth book in Mike's Ron Shade, private investigator series, and the third in my Alex St. James mystery series (after Deadly Blessings and Deadly Interest). Both protagonists are based in Chicago, and Mike and I were in the same writing group at the time, so we started to write this book for fun. As we moved forward, we realized that it might actually, really, kinda turn out well. And I like to think it did. Five years ago, it was published in hardcover and distributed mostly to libraries (if you're interested, check to see if your library carries it), but now -- finally -- it's been re-released as an e-book from Crossroad Press! Would I ever collaborate again? Not sure. The process certainly had unique challenges. But I'm very happy with how Dead Ringer turned out and I hope you are, too. Alex was my first series protagonist and I think she's pretty cool. Have you read any of the Deadlies? Haven't read any of the deadlies yet. I just love the title State of the Onion, think I'll find that one first. I love your White House cozies and I just found about the Deadlies...those are next on the list! I have to admit, they do look interesting! I hope you enjoy State of the Onion. That one is pretty cozy! Thanks, Cynarra! Hope you think they're fun. I definitely had fun writing them! Yes I have read all the deadlies and I'm looking forward to reading this one.